Introduction: Chagas disease also known as American Trypanosomiasis is mainly caused by haematophagous insects widely distributed from Mexico to Argentina. According to the Panamerican Health Organization, 7.7 to 10 million people are living with chronic infection. Chagas disease is caused by Trypanosoma cruzi, a protozoan transmitted by triatomine vectors. After an initial acute phase, Chagas is followed by a silent phase that lasts 15-20 years before debuting with cardiac, neurological or gastrointestinal manifestations. Objective: To analyze the atypical clinical course of chagasic cardiopathy in a pediatric patient from southern Mexico. Case report: The patient was treated by a chagoma in his left leg. Five months later an electrocardiogram showed evidence of sinus tachycardia and left atrium distension with P wave enlargement and prolonged QT interval. The thorax radiography showed cardiomegaly (Cardio-thoracic index = 0.52); the trans-thoracic echocardiogram showed left atrial and ventricular dilation. Conclusion: It is important to develop early cardiac evaluations even in pediatric patients with Chagas disease, it should not be assumed that the patients will undergo a long asymptomatic phase or that they will not develop an early cardiopathy. The Chagas Disease (ChD), also known as American trypanosomiasis, is transmitted by a hematophagous insect in underserved urban and rural areas of Latin America (LM). According to the Pan American Health Organization, between 7.7 and 10 million people are estimated to have chronic ChD, and few of them are aware. Because of the lack of awareness, underreporting, along with other factors, ChD has been declared as a neglected disease. ChD is characterized for being a tropical parasitic disease, caused by the flagellate protozoan Trypanosoma cruzi (T. cruzi), that affects the cardiovascular system as well as the digestive and nervous system. In Yucatán, the vector transmission through the Triatoma dimidiata vector is the primary mechanism of infection with T. cruzi. The parasite can also be transmitted vertically from the mother and secondarily after blood transfusions. The state of Yucatan has the second highest incidence rate of ChD in Mexico. In a serosurvey carried out in 2014 among pediatric population, a seroprevalence of 0.17% was reported even tough cases of ChD among school aged children had been reported between 2013 and 2015. In this clinical case report, the aim is to describe the unprecedented case of a school aged patient with early cardiac dysfunction manifestations of ChD, and to analyze the relevance of entomological monitoring in the region as epidemiological surveillance measure along with early clinical and population based prevention strategies1-4. 7-year old patient, of a low economic stratum, who resides in a recently urbanized neighborhood, with no personal pathological antecedents during his gestational or perinatal development nor in his earlier childhood. He was born to a primigravid, 23-year-old mother who gave birth at the community hospital. After delivery, the child´s inspection and valuation were carried out by a neonatologist, and no pathological signs were found. During the first year of life, his mother and he moved into the house of patient’s father used to live with the two children he had had with his former wife. In the course of the next two years, his half-brothers (13 and 17 years-old, respectively) died both due to a heart failure of unknown origin, the same that was discarded in both cases as a failure of congenital origin, suspecting that both were afflicted by chagasic cardiopathy. Currently, the patient lives with two younger brothers, who seem to be healthy. In February 2016, the child was taken by his mother to the community clinic because he developed a painful chagoma of approximately 3 cm in diameter in his left leg. Chagoma was accompanied by local hyperemia and a slight pain in the lower limb associated with ambulation. In anamnesis, the mother stated that it was not the first that she had seen a similar lesion in the patient and identified graphically the Triatoma dimidiata as the vectors that can be normally found in their peridomicile area. In that time, he tested positive for indirect haemagglutination test (Wiener Lab©) of the detection of antibodies against T. cruzi (95-98% positive predictive value) and, posteriorly, resulted reactive on IgM analysis using ELISA method, thus he was referred to a highly specialized hospital to his valuation by the pediatric subspecialists, though he received a routine reference (not a priority) with the diagnosis of “acute Chagas disease that does not affect the heart”, and discharged without treatment. Weeks after, the edema in the area affected by the chagoma decreased and the patient remained asymptomatic and afebrile. In respect to the epidemiological surveillance measures, there were no reports for home visits nor vector surveillance in the house surroundings. Although it was performed a ChD serum test to the mother, the screening was only for her and excluded other family members. Three months later, in his pediatric evaluation, the patient weighed 17.6 kg, and was 104 cm tall, with axillary temperature of 98.2°F (36.8°C), breathing rate of 28, and heart rate of 100 beats per minute. No other clinical or pathological findings were identified with the inspection, palpation or auscultation of the different systems. Laboratory tests were carried out, including the detection of IgG by ELISA method, blood biometry and liver function tests, lipid profile and blood chemistry (see Table 1). In the laboratory results, it was identified that the blood biometry counted with normal values in the white blood cells, red blood cells, and the platelets count, but it drew attention the elevation of the globulin, the alanine aminotransferase (ALT), urea, creatinine, and uric acid in relation to the reference values for his age5. Additionally, a chest radiography and an echocardiogram were requested. The patient stayed on with no specific treatment for trypanosomiasis and was referred from the secondary-level hospital to a third-level hospital for care by the pediatric cardiac subspecialists, where he was attended five months after of the primary infection. Two electrocardiograms were performed under the pediatric cardiology care. In the first one, it was observed an expansion of left atrial evidenced by the presence of long P waves and prolonged QT interval (figure 1). And, the second electrocardiogram showed sinus tachycardia (107/min). Figure 1. Thorax radiography. Cardiomegaly with a cardiothoracic index of 0,52 (cut-off point for cardiomegaly in schoolchildren = 0.45, according to Ibáñez-Fernández & Diez-Tomás 2006). 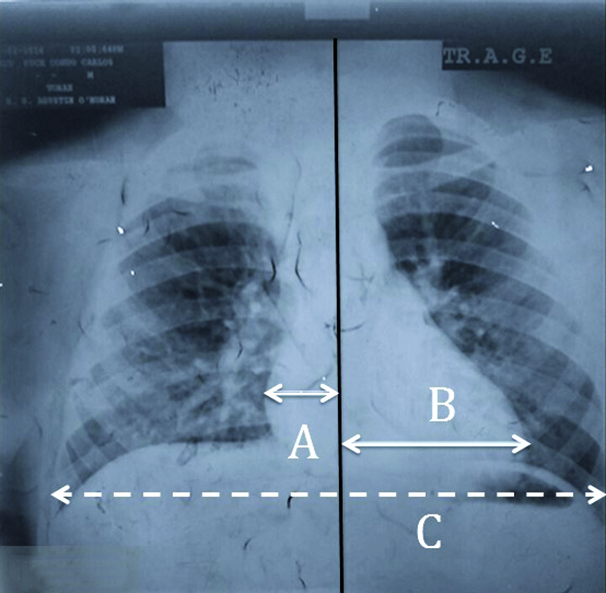 A cardiomegaly was visualized in the chest radiography with a cardiothoracic ratio of 0.52 (figure 2). In the chest electrocardiogram, a left atrium and ventricle dilation were found. In order to mitigate the cardiac manifestations, the pediatric cardiologist initiated symptomatic treatment with spironolactone by mouth of 25 mc every 24 hours. Figure 2. Electrocardiogram. Sinus tachycardia, left atrial enlargement and prolonged QT interval. Seven months later of the primary infection, the efforts to obtain and allocate the treatment based on benznidazole and nifurtimox resulted positive and the patient has initiated his treatment. Recently, it has been reported that the mother was not reactive according to the serological testing to IgM and IgG performed. We have reported the case of a pediatric patient with a serological diagnosis of trypanosomiasis, who lives in an endemic zone and shows electrocardiographic, echographic, and radiological changes of chagasic cardiopathy. We have here presented the clinical manifestations including heart dysfunction within a three months period after having contact with the vector. The existing literature agrees that the clinical manifestations, electrocardiographic and radiographic changes normally tend to decrease within the first two or three months after the trypanosomiasis onset. Precisely, at the end of the acute phase. However, 10% of patients develop heart dysfunction after passing the chronic asymptomatic phase, when cardiac manifestations can be evidenced, as in this case, with electrocardiographic signs of dilation6-10. The cardiomyopathy is the most severe and common complication of the ChD; 60-70% of patients that course a silent phase of the trypanosomiasis debut with cardiac insufficiency from 5 to 15 years after the primary infection, developing coronary insufficiency, a Bundle Branch Block or semi block, and thromboembolic phenomena9,11. The prognosis of the patient presented here could be less favorable for showing disease progression since an early phase, a few weeks after the primary infection. Though, there is also the possibility that the contact with the vector was actually not the first time that the child was attacked by an infected triatomine. According to the mother’s discourse, the presence of the vector is common in the in the peridomicile and the patient could have been exposed to the transmitting vectors previously. If we combine that with the potential infection to T. cruzi that could be associated with the brothers’ deaths, we can rationalize, beyond the mere speculation, the need of performing a deliberate entomologic search in the peridomicile area12,13. With the deliberate research, the control trough mechanic and chemical measures would have been performed after the brother’s death and the possibility the infection of the case presented here could have been prevented since it has been demonstrated that this method is useful in the identification of focus of infection. If the researches are not done routinely the presence of suspicious or confirmed cases, the vector-borne transmission could maintain or increase the burden of disease in the area13. It is important to coordinate correctly the interdisciplinary work of the health authorities with the clinical approach to prevent the transmission by an effective vector-borne control, otherwise, only the most evident cases would be identified and the real impact of the disease would remain unknown and thus, neglected14. In countries such as Argentina and Brazil, the continuing education programs of vector surveillance at schools are continuously, and as a result, there has been an increase the awareness among the school aged children and such awareness has been useful to increase the self-efficacy among the population at risk. In Venezuela, the health campaigns have interrupted the domestic transmission of vector and periodic serosurveys among young people (under the age of 15 have) , improving the early diagnosis of seropositive individuals and decreasing the clinical and epidemiological impact of the ChD nationwide, yet, Venezuelan health authorities recognize the need to optimize and develop effective programs to prevent vertical and transfusion transmission. Uruguay, a country that was once considered endemic for Chagas due to massive vector transmission in the 66% of its territory. Has now redesigned screening measures in blood banks and organ donations, and reduced the vector transmission due to anti-vector campaigns; actually, Uruguay has eradicated intradomicile transmission of ChD since 1997. Additional screening programs targeting pregnant women, have also been implemented nationwide, and to date efforts have been directed to reinforce the follow-up of Chagas cardiomyopathy in children in the asymptomatic phase of seropositive young patients. Undoubtedly, the implementation of combined and complementary programs could improve by far the prognosis and decrease the burden to ChD as a neglected disease that affects the Mexican society15-18. On the other hand, in Mexico, as in other Latin American countries, the availability of medication to trypanosomiasis is limited and expensive, and the lack of access and availability of pharmacologic treatment, poses a barrier to an opportune treatment of the disease, meaning a major challenge for the Mexican health authorities19. The school-age patient debuted with early cardiac manifestations. Therefore, it is important to make timely and consecutive evaluations to find cardiac dysfunction even in pediatric patients. It should not be assumed that pediatric patients will course with a silent phase or they will debut with chagasic cardiopathy only after many years. 1. Secretaría de Salud. Dirección General de Epidemiología. Informes de Morbilidad por Enfermedad. Disponible en: http://wwwepidemiologiasaludgobmx/dgae/infoepid/inf_morbilidadhtml Consultado el 10/09/2016. 2. Monteón V, Solís-Oviedo R, Lopez R, Hernández O, Tellez CA. Low seroprevalence of Trypanosoma cruzi infection and chronic chagasic cardiomyopathy in a region with abundance of triatomine vectors in Yucatan Peninsula of Mexico. Ann Parasitol. 2014;61(4):263-7. 3. Gamboa-León R, Ramírez-González C, Pacheco-Tucuch FS, et al. Seroprevalence of Trypanosoma cruzi among mothers and children in rural Mayan communities and associated reproductive outcomes. Am J Trop Med Hyg. 2014;91(2):348-53. 4. Reyes-Novelo E, Ruiz-Pina H, Escobedo-Ortegon J, Barrera-Pérez M, Manrique-Saide P, Rodríguez-Vivas R. Triatoma dimidiata (Latreille) abundance and infection with Trypanosoma cruzi in a rural community of Yucatan, Mexico. Neotrop Entomol. 2013;42(3):317-24. 5. Custer J, Rau R. The Harriet Lane Handbook: Mobile Medicine Series - Expert Consult. Hospital J-H, editor: Elsevier Health Sciences; 2008. 6. Esper L, Brant F, Weiss LM, Tanowitz HB, Machado FS. Trypanosomiasis and Cardiac Disease. Pediatric and Congenital Cardiology, Cardiac Surgery and Intensive Care: Springer; 2014. p. 2407-19. 7. Benvenuti L, Roggério A, Freitas H, Mansur A, Fiorelli A, Higuchi M.
Chronic American trypanosomiasis: parasite persistence in endomyocardial biopsies is associated with high-grade myocarditis. Ann Trop Med Parasitol. 2013. 8. Rassi A, de Rezende JM. American trypanosomiasis (Chagas disease). Infect Dis Clin North Am. 2012;26(2):275-91. 9. Garcia MN, Murray KO, Hotez PJ, et al. Development of chagas cardiac manifestations among Texas blood donors. Am J Cardiol. 2015;115(1):113-7. 10. 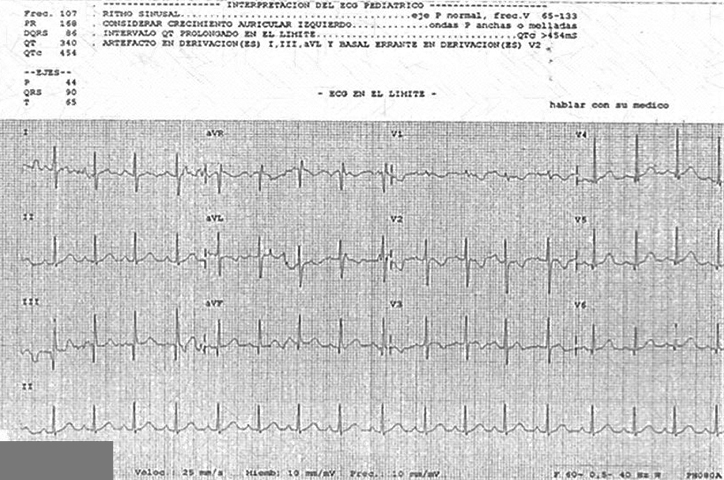 Ibáñez-Fernández A, Diez-Tomas J. Protocolos de Cardiología. Bol Pediatr. 2006;46:273-80. 11. Barros MV, Leren IS, Edvardsen T, et al. Mechanical Dispersion Assessed by Strain Echocardiography Is Associated with Malignant Arrhythmias in Chagas Cardiomyopathy. J Am Soc Echocardiogr. 2016;29(4):368-74. 12. Giraldo JD, Parra DJ, Pine V, Vargas YC. Situación actual del programa de control de la enfermedad de Chagas en Colombia 2013. 13. Vásquez C, Robledo S, Calle J, Triana O. Identificación de nuevos escenarios epidemiológicos para la enfermedad de Chagas en la región momposina, norte de Colombia. Biomédica. 2013;33(4):526-37. 14. Requena-Méndez A, Albajar-Viñas P, Angheben A, et al. Health policies to control Chagas disease transmission in European countries. PLoS Negl Trop Dis. 2014;8(10):e3245. 15. Dias JCP. Evolution of Chagas disease screening programs and control programs: historical perspective. Global Heart. 2015;10(3):193-202. 16. Feitosa GS. Prevention and Control of Cardiovascular Diseases Focusing on Low-and Middle-Income Countries. Prevention of Cardiovascular Diseases: Springer; 2015. p. 195-205. 17. Feliciangeli D. Control de la enfermedad de Chagas en Venezuela. Logros pasados y retos presentes. Interciencia. 2009;34(6):393-9. 18. Salvatella R. Chagas en Uruguay, 1937-2016: Información básica para su prevención, control y atención. Archivos de Pediatría del Uruguay. 2016;87(1):49-52. 19. Manne JM, Snively CS, Ramsey JM, Salgado MO, Bärnighausen T, Reich MR. Barriers to treatment access for Chagas disease in Mexico. PLoS Negl Trop Dis. 2013;7(10):e2488.